Back during the war years there wasn't a lot of meat to go around and so families often dined on such favourites as Woolton Pie, which was an adaptable dish of vegetables, created at the Savoy Hotel in London by its then Maitre Chef de Cuisine, Francis Latry. 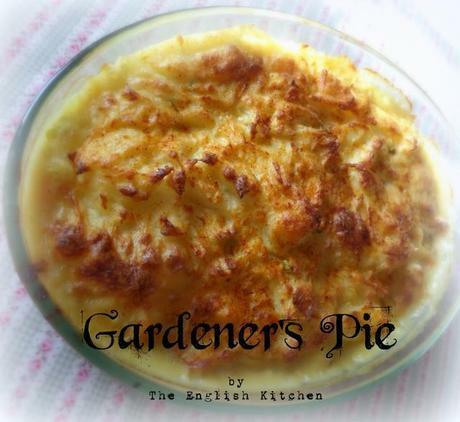 It was one of a number of recipes commended to the British public by the Ministry of Food during the Second World War to enable a nutritional diet to be maintained despite shortages and rationing of many types of food, especially meat. It wasn't named after the chef, but after the 1st Lord Woolton, Frederick Marquis, who became the Minster of Food here in the UK in 1940. 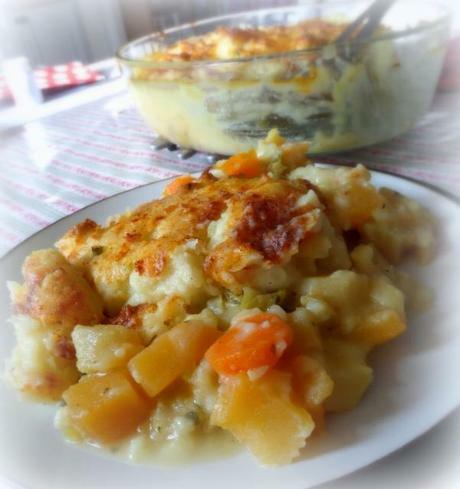 It was a simple recipe which involved dicing and cooking potatoes (or parsnips), cauliflower, swede, carrots and, possibly, turnip. Rolled oats and chopped spring onions were added to the thickened vegetable water which was poured over the vegetables themselves. 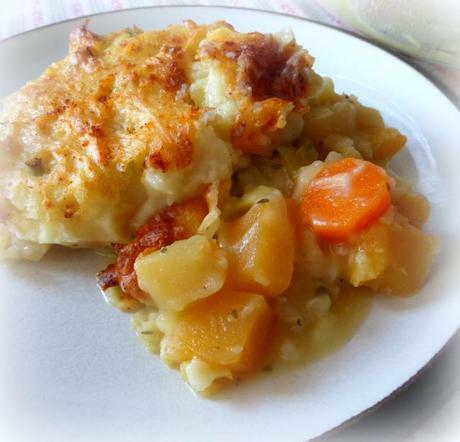 The dish was topped with potato pastry and grated cheese and served with vegetable gravy. The recipe could be adapted to reflect the availability and seasonality of ingredients. And most people had Victory Gardens in the back yard and grew a lot of their own veg, so it was quite practical and filling as well. This isn't a Woolton Pie per se which I am showing you here today, however loosely based upon it, but a sort of Veggie Shepherd's pie. There is no oats involved. There is no pastry. 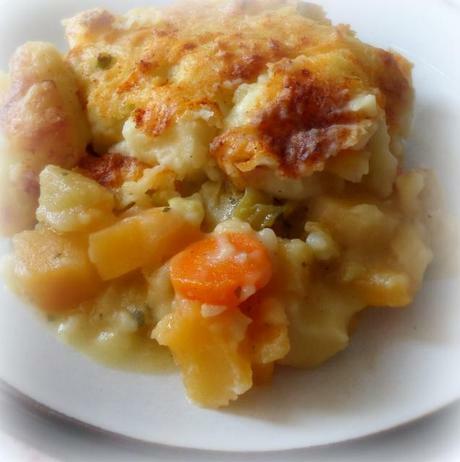 Just lots of tasty vegetables and a nice hot topping of cheesey mash. It's so tasty, I guarantee you won't miss the meat, but if you have any die hard carnivores in the family, you could always offer this in smaller portions and serve a few chops on the side. Myself, I could quite happily sit down to a plate of this and nothing else. This all vegetable pie might be filled with humble ingredients, but there’s nothing humble about the taste. 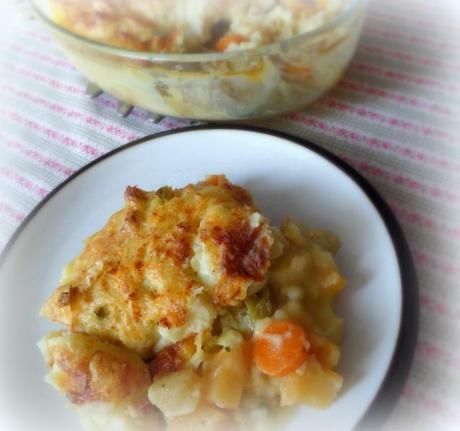 This makes a delicious lunch or supper dish. It’s also a great accompaniment to roast beef or lamb if you really must have some meat, but trust me when I say that it is truly satisfying on it’s own. Pre-heat the oven to 220*C/450*F/gas mark 7. Peel and chop the onion. Peel and dice all the other vegetables into a uniform dice. Heat the olive oil in a large skillet. Add the onion and vegetables and cook them over medium high heat, stirring from time to time until they just start to color. Add enough stock to just barely keep them from sticking to the pan and reduce the heat to medium low and cook, stirring occasionally until all the liquid has evaporated and the vegetables are still crispy tender. Season them to taste with some salt and a good grinding of pepper. Stir in the herbs, and then pop the whole mixture into a pie dish. It may seem a bit dry, but not to worry, the final baking in the oven will release all those delicious vegetable juices. 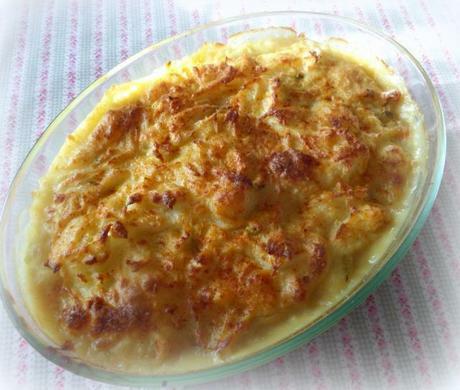 For the topping put the potatoes into a pan of salted boiling water and cook them until they are fork tender. Drain well and return the potatoes to the pan. Give them a good shake over the still warm burner to dry them out a bit and then mash them well along with the butter and sour cream. Stir in the cheese and grated onion. Add only enough milk to make them nice and fluffy. You don’t want the mixture to be too loose. Season to taste with salt and black pepper. 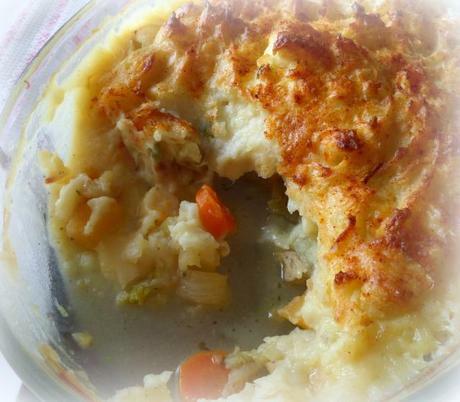 Pile the fluffy mash on top of the cooked vegetables and bang the pie dish into the heated oven. Cook for about 15 to 20 minutes until the topping is nicely browned. Serve hot.